We are living in the age of technical era and smart phones are ruling the world with their effective applications. Android phones are useful in many ways as these are playing key role in finding jobs. Nowjob seekers can get immediate notificationthrough their mobile with tips on fingers. Not only job alerts they also get notifications with regard to Resume writing tips, networking with professionals, pointers for an interview and help in building an impressive social resume are available on wisdomjobs mobile app. Smart phones have been equipped with android mobile operating system is useful as powerful devices to search jobs and apply the suitable jobs immediately on your mobile. 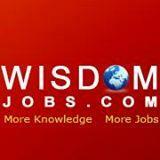 Just you have to downloadwisdomjobs mobile app and register your name on it. Fill up the required details and start job search. You can search jobs on different categories like ob category, experience and location and functional skills. Once your registration is done then you are going to get updated related to the job opportunities matching with your profile. The users can apply to multiple jobs matching their specifications and profiles without any hassle. A recent report on job search trends reveals that more job seekers are looking for new opportunities on mobile devices than a desktop. And mobile users are 34 percent more likely to go onto job portals site between 6 and 10 a.m. compared to going onto their desktop. The survey also revealed mobile users are more likely to hop online to look for a new role over the weekend compared to desktop users. And mobile users check out 20 percent more jobs each week than desktop users.